Ready for a bailout of your own? Arlington's Restaurant 3 is now offering a Bailout Blue Plate special, Sundays through Thursdays during dinner. For $15.95, you'll get a selected dinner entrée created by chef Brian Robinson and a glass of paired wine. “The blue plate has historically been a value-driven, belly-filling meal consisting of a meat and two sides,” Robinson says. Dishes will include southern fried chicken with mac and cheese and greens, country-style pork ribs with a crisp Carolina slaw and roasted corn and potato salad, and cioppino, a San Francisco-style fish stew. The Blue Plate specials will run at Restaurant 3 indefinitely. Look for new restaurant deals on Metrocurean each Wednesday. I live in the building and eat there quite often. The signs strewn about the restaurant clearly state that the special runs Sunday through Thursday 5 - 7PM. You are right, though. When they did the dry run of that special a month or so ago, it ran throughout dinner, but the permanent special is from 5 – 7. 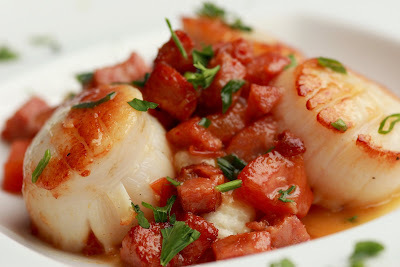 By the way, I love the scallops with grits! !